Dragon’s Teeth sucked me in from the first page and it was with great disappointment that it ended. 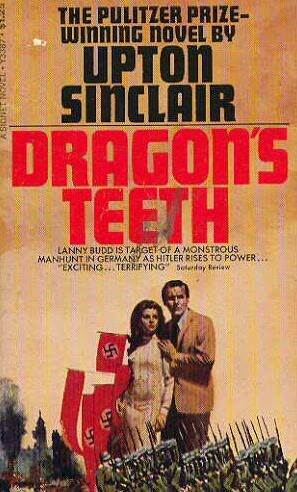 The story is a fictional account of Hitler’s rise to power and Sinclair did an impressive job of depicting the utter disbelief of the world. People simply couldn’t believe the things they were hearing, because it didn’t seem possible they could happen in a ‘civilized’ world. Of course, they did happen and eventually the characters were forced, in various ways, to come to grips with the reality of the matter. Parts of the narrative were difficult to read because it was always in my mind that while it is a novel, the subject is anything but fiction. The writing was effective, fast-paced, and masterful. There is no question that this book deserved the Pulitzer it won. This entry was posted in book reviews, Chunkster Reading Challenge, fiction, pulitzer and tagged book review, chunkster reading challenge 2012, fiction, pulitzer, sinclair. Bookmark the permalink.